Reveal beauty-full skin in a dash! Brighten, conceal and de-age with Pevonia's all-natural formulations sure to have you looking flawless at home or on-the-go! EyeRenew™ Conceal & De-Age Treatment, 0.34 oz. ; LipRenew™ Plump & De-Age Treatment, 0.5 oz. & YouthRenew™ Tinted Cream SPF 30, 1.0 oz. Self-Adjusting Mineral Tint, Smooths Lines + Wrinkles, Reduces Puffiness, Conceals Dark Circles, Diminishes Redness, Oil-Free Formula while YouthRenew provides broad spectrum SPF 30 protects from UVA/UVB rays. A pinkish tint to the skin may appear accompanied by a warm and tingling sensation which subsides within minutes. This temporary effect is due to the circulation enhancement for optimum absorbency and results. Wash hands thoroughly. 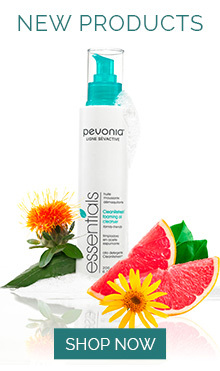 First, thoroughly cleanse the skin with your ideal Pevonia Cleanser and Lotion/Toner. EyeRenew™ Conceal & De-Age Treatment: apply a small quantity of EyeRenew on the eye contour and blend to perfection. Apply morning or evening, or when needed. Recommended for all skin types. CAUTION: For external use only. Do not ingest. Avoid contact with eyes. Flush eyes thoroughly with water if contact occurs. Keep out of reach of children. Discontinue use if signs of irritation or rash appear. LipRenew™ Plump & De-Age Treatment: In the morning or evening, apply a small quantity of product on your lips, around lip contour, and laugh lines. Massage well until absorbed. Continue with your daily Pevonia® skincare regimen. For all skin types. Important Note: A pinkish tint to the skin may appear accompanied by a warm and tingling sensation which subsides within minutes. This temporary effect is due to the circulation enhancement for optimum absorbency and results. Wash hands thoroughly. Avoid contact with the eyes. YouthRenew™ Tinted Cream SPF 30: to achieve your perfect coverage and even tone, pump 1-3 drops of this daily tinted cream with SPF 30 and apply morning or when needed over face and neck. Suitable for all skin types. Apply liberally 15 minutes before sun exposure. Reapply: after 40 minutes of swimming or sweating; immediately after towel drying; at least every 2 hours. Sun Protection Measures. Spending time in the sun increases your risk of skin cancer and early skin aging. To decrease this risk, regularly use a sunscreen with a broad spectrum SPF of 15 or higher and other sun protection measures including: limit time in the sun, especially from 10 a.m. - 2 p.m.; wear long-sleeve shirts, pants, hats, and sunglasses; children under 6 months: Ask a doctor. Please see individual full size products for complete list of ingredients. In today’s tech-savvy culture, prolonged visual exposure causes digital eye strain that takes a toll on our fragile eye zone. When combined with other factors such as lack of sleep, aging, harsh beauty products, the environment and stress, the result is often weary, dry and age-revealing eyes. EyeRenew™ Conceal & De-Age Treatment offers the ideal solution with a creamy, lightweight, multi-benefit formula aimed at repairing the eye contour while also refreshing, reviving and renewing. Pevonia’s Proprietary EyeAwaken™ Complex unites a natural blend of youth-reviving ingredients such as Plankton, Marine Collagen, Silanetriol, Hyaluronic Acid and more to repair and flawlessly conceal. Featuring advanced manufacturing, this powerhouse Conceal & De-Age Treatment addresses the most common concerns by smoothing crepiness, crow’s feet, and wrinkles while alleviating dark circles and puffiness. EyeRenew™ Conceal & De-Age Treatment provides a flawless look as it refreshes, revives and renews this delicate area. Recommended for all skin types.